Why is there another tutorial beside Tutorial Voting? Six Million pageviews on the blog since the start have been breached and your miniature painting jungle did not yet celebrate it's 5th birthday (September will be the month to do so). That means an average of over a million pageviews a year for the jungle. Wow! The MV-Team thought this is a moment to celebrate with you, our readers. To say thanks that you are reading in the jungle blog we bring you some surprises this week beside the regular jungle content. 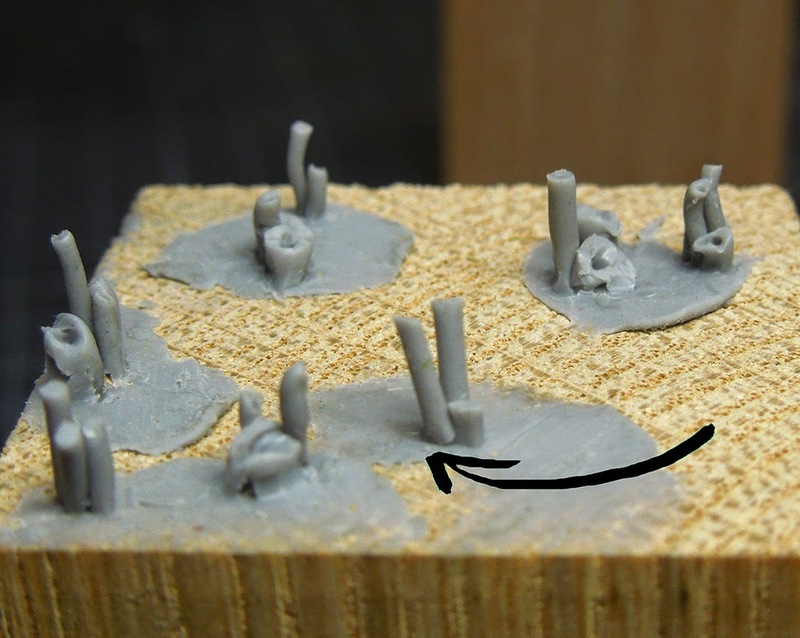 Let's start with the following article about how you can create candles for your basing, written by Roman. Candles are good to celebrate something, eh? Let's jump into Roman's brain now. we had the private coaching with Matthias who did choose to build up a dungeon display base. Raffa and Roman did build a base too and guided Matthias through his own. During the progress of all three bases we thought: There is no proper fantasy dungeon without ... right, candles. 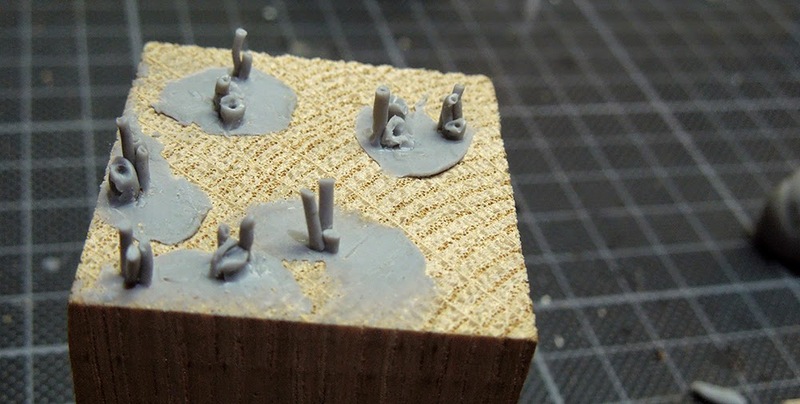 Let me explain to you an easy way on how you can create your own candles for your scenery. 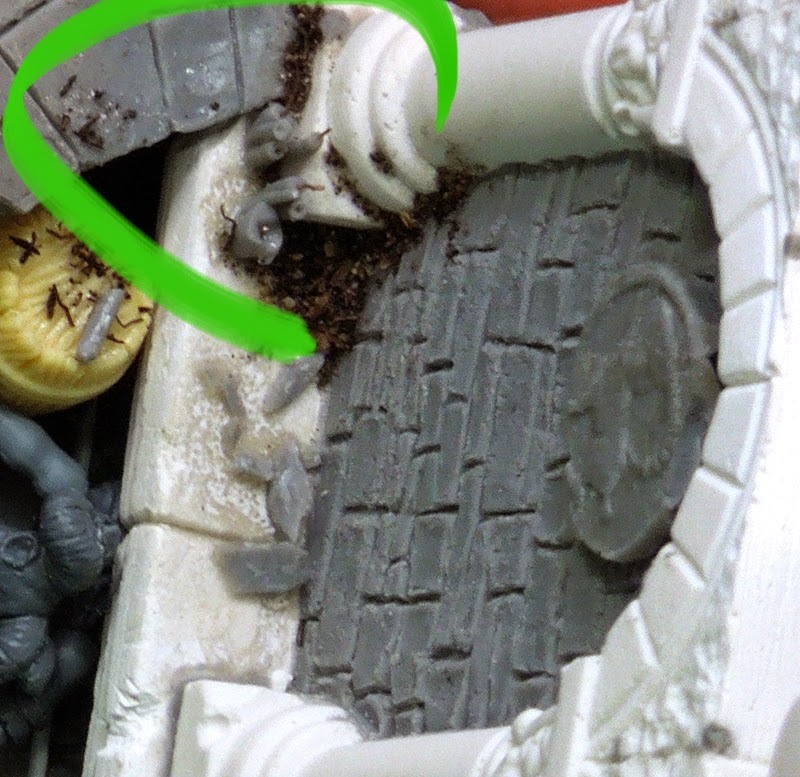 Next put some of the putty to the ground of your working plinth you work on. Why? Simple answer: If you don't the candles won't have a good grip on the wood or cork and will not stand vertical. Now place your candle sticks to the putty areas with the use of the blade or the toothpick. Form groups and little candle families. Take the toothpick or your sculpting tool of choice to create the typicall look of candles. Melted wax. You can take whatever time is needed to form and sculpt the candles you like to have.Well, I tried, but I am not perfect here. Nevermind. When you are happy with your results it is time to put them in the oven. BeesPutty bakes at 120° for about 20 minutes. 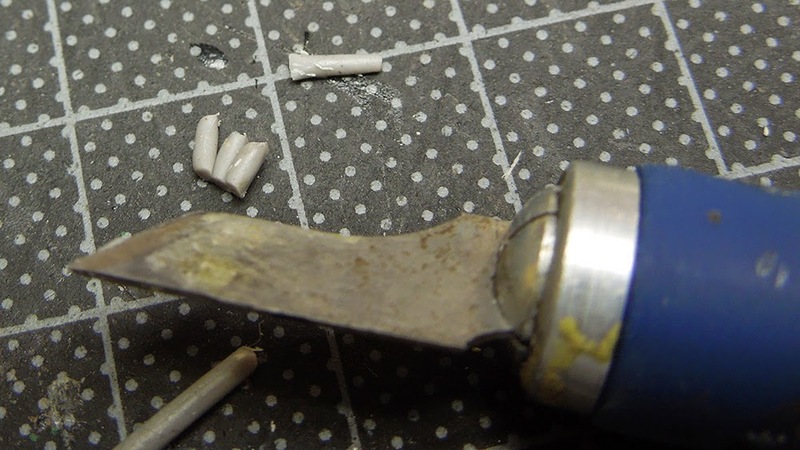 Afterwards carefully cut them off the ground and place them as you like on your base with superglue. A little candy-family there, or here and some single ones here and there. Sorry for the messy base WIP, it is a base-WIP. One important thing is still missing: The candlewick. 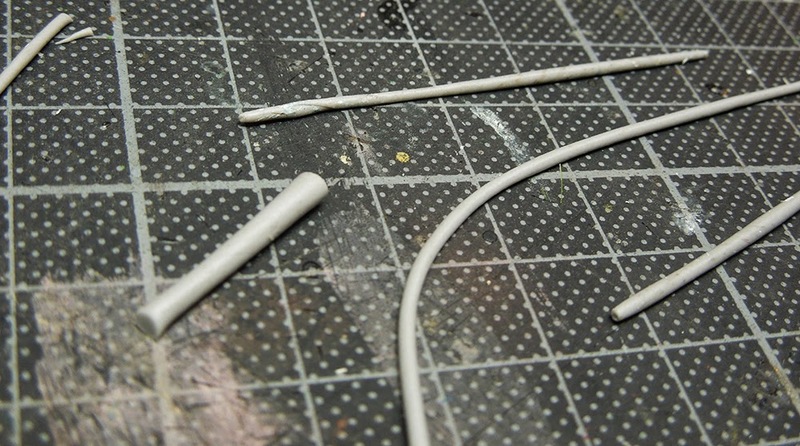 By using thin wire, which was cut in small pieces those have been created and placed with superglue. 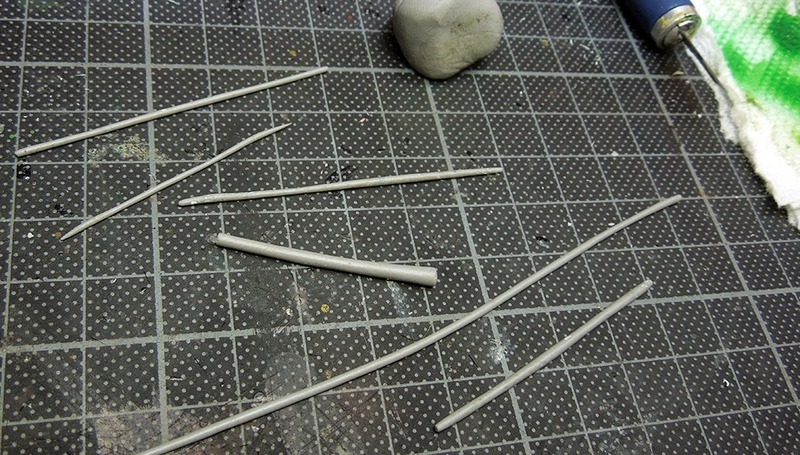 Carefully using the tip of a toothpick to bring on a small amount of glue where it was needed, turning the toothpick around, using the other tip and a little bit of spit on it to pick up the candlewick. Then put it where you want it. Don't mix up your toothpick's tips, you might fast regret it if the toothpick is superglued to your tongue. 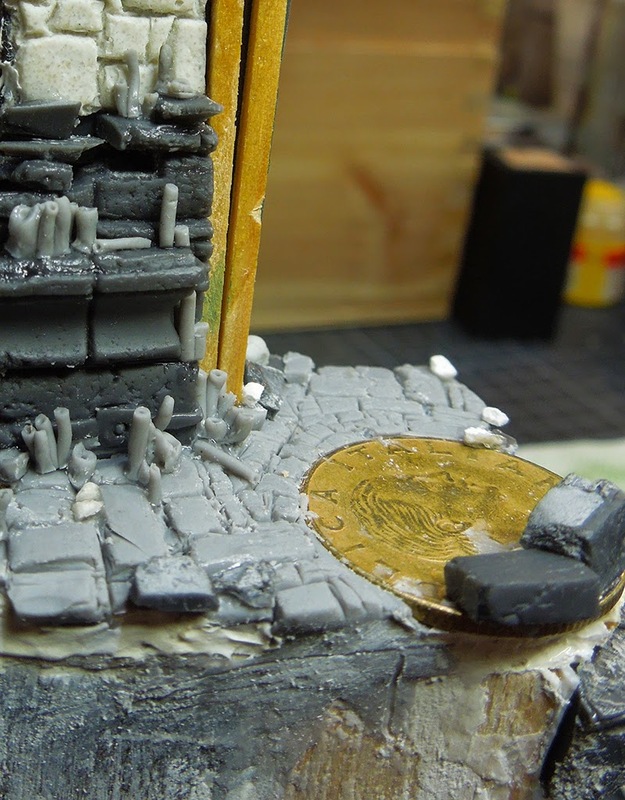 On Matthias' base, which was build for his WIP-Dark-Elve-Sorceres you can spot the candles in a little corner of the dungeon. They occour as a small detail as they are in the right scale. Keep that in mind to work in the right scales if you add such small details. Sure, there are also bigger candles like those we created here, you have to make your thoughts on your own about scales and candle sizes. I won't tell you which colour Matthias or I will paint his/my candles as this is also something you have to decide on your own. Keep on happy painting and light a candle sometimes! Thx for an another great article and Congrats for the 6 million views . BTW beautiful Basework of Matthias.